The First Course in Mormon Literature? As I understand it, university-level Mormon literature courses have been taught since the late 1970s, mainly at BYU thanks to the efforts of Eugene England. 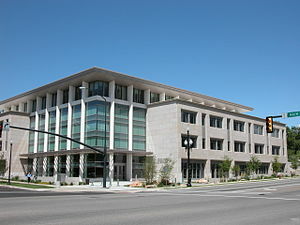 In recent years the number of courses have increased, and currently exist at least at BYU, LDS Business College and Utah Valley University. And there have been courses with Mormon literature components taught elsewhere as well. But the university level isn’t the only place where Mormon literature courses could be taught, and as I’ve already noted, the idea of using Mormon writing to teach children, at least, occurred to Parley P. Pratt quite early. Now, I’ve come across another course, this one aimed at Relief Society sisters in 1948. And this course was apparently taught–at least in some Relief Societies. Still better, its author was a recently retired English professor who had taught for 19 years at New York University. Author tylerchadwickPosted on 03/27/2014 Categories History, LiteratureTags Authored by Kent Larsen, history of Mormon literature, Howard R. Driggs, Mormon Literature Course4 Comments on The First Course in Mormon Literature? As I’ve tried to study the history of Mormon literature, I’ve realized that we are currently are in a oddly mixed situation. By and large what Mormon literature has been produced through the past 175+ years is easily available to anyone with a good Internet connection, a basic computer and the ability to read and understand English. But when we move to criticism and compilation of this literature, the wonderful new archives of material might as well not exist. Is anyone working with these old texts? Right now, Chris Bigelow and I are collaborating on a volume tentatively titled “The Latter-Day Saint Family Encyclopdia,” which will be published this fall by Thunder Bay Press and sold fairly widely. As you might imagine, we’re taking advantage of the opportunity to write a good, meaty entry on Mormon literature. Chris has posted my draft over on the AML blog website. We’d like to invite you all to review it and post comments and suggestions. We can’t let this entry get any longer, but we can certainly refine what’s here. Thanks in advance for your help! What are some of the major developments in Mormon literature over the past 20 years? Being under the painfully pleasant necessity of writing a short article (500-1000 words) during the next week on Mormon literature for a forthcoming reference work, this is something I’ve had occasion to ponder. I have an excellent source for up to about 1990 with the articles that were written for the Encyclopedia of Mormonism, but there’s an awful lot that has happened since then.